We are not talking of the middle ages or even the 19th century. As recently as 1966 in the UK, and 2002 in the U.S, it was illegal to be homosexual. Patricia Highsmith’s 1952 novel, The Price of Salt – itself written under a pseudonym due to the legal climate – is the source text for Todd Haynes’ Carol. It is a work that wrestles the cultural attitudes of a bygone era. Attitudes that would denote natural leanings as illicit. Highsmith specialised in dealing with characters at odds with either moral or cultural mores of a set era (Strangers on a Train, The Talented Mr Ripley and The Two Faces of January to name but a few) and this is once again apparent in Cate Blanchett’s tortured titular character. In the midst of a divorce due to an alluded to, but never explicitly confirmed, lesbian love affair with an old childhood friend, Abbey (Sarah Paulson), she is guilty of Oscar Wilde’s lover Lord Alfred Douglas’s mooted, ‘the love that dare not speak its name’. Rooney Mara’s department store clerk, Therese, has her world turned upside down by Carol’s arrival into her place of work one day. Young, uncertain; coy and shy, Therese is groping for a grasp of who she is and what she wants. Her doting, but suffocating, boyfriend doesn’t make things any easier for her. What unfolds is a delicate dance around attraction, chemistry and the demands of the times. 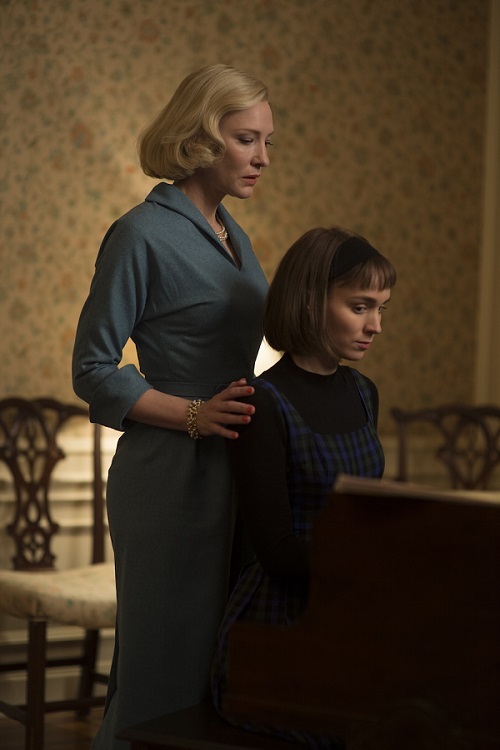 Carol doesn’t fall down the Hayne’s hole of his last Cate Blanchett vehicle – Bob Dylan biopic-of-sorts, I’m Not There. On that outing, as high-concept and ambitious as it might have been, it was also irrevocable mess. Fear not, this is leaner and with a clearer sense of purpose than that. Instead, it is a return to the 1950s for Haynes that worked so well with Julianne Moore in his Far From Heaven. The real stars of this though are the cast. Blanchett is so relentlessly brilliant these days that it is positively frightening; here, she merges a Dietrich-ness with a Bacall assuredness. She has heaps of charisma, but she is also an enigma. Similarly, Rooney Mara is transformed; and offers a performance to challenge Saoirse Ronan in Brooklyn for 1950s containment. Aside from some dialogue clangers such as, ‘Some things don’t react, but everything’s alive’, this is a potent piece. Pastel colours predominate the palette. The glamour of the 1950s reverberate from the screen. And Haynes has laboured a worthy, yet also worthwhile, drama. It has been lauded by many critics as a masterpiece. It is too early to tell if it is deserving of such hyperbole. The true measure is the test of time. We shall see how it treats Carol. Carol is in cinemas from 27th November 2015. This entry was posted on 27/11/2015 by toomuchnoiseblog in Reviews.